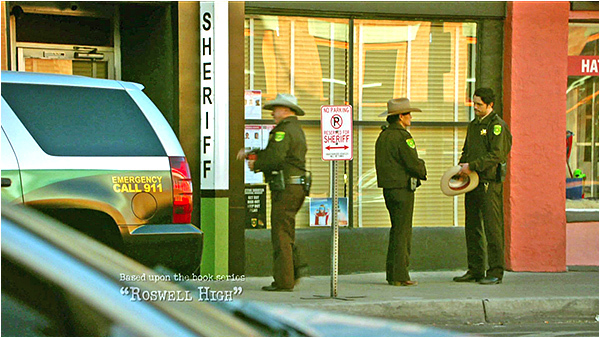 "Roswell, New Mexico". 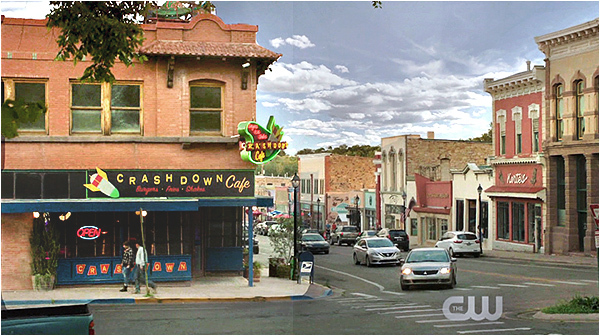 If you are looking for the locations of the original "Roswell" series (which aired from 1999 to 2002), just click here. Where was the TV series "Roswell, New Mexico" filmed? If you've seen my older page about the filming locations of the original "Roswell" TV series, you know that show was filmed on location in Covina, California. and track down the location of the NEW "Crashdown Cafe". But since I live in L.A., and I knew that this new series was shot in New Mexico, I thought my chances of finding the new location were slim and none. Fortunately, I surprised myself and found it, simply by going to Albuquerque, New Mexico, via Google StreetView, and searching through town until I spotted it. at 500 Central Avenue, in Albuquerque, New Mexico. That's at the southwest corner of Central Ave & 5th Street. 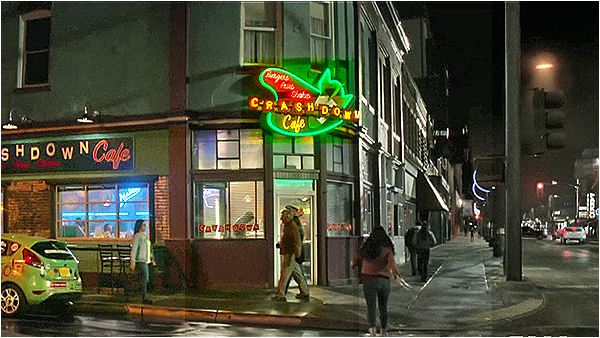 Originally, its walls weren't green (a Google StreetView from 2017 shows it was mostly a light brown, with green trim), so the producers painted it green and put up those fake "Crashdown Cafe" signs - including a neon sigh over the main corner entrance, which covers up the actual Lindy's name. 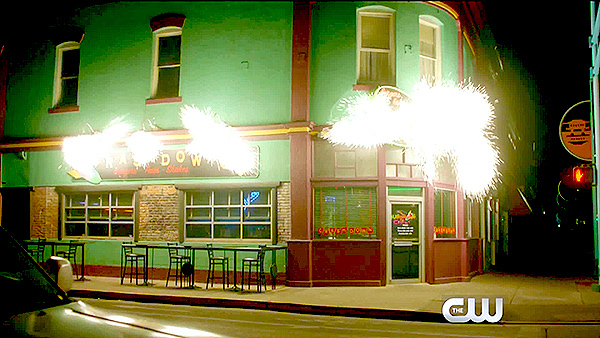 However, I've seen some recent photos (2019) that show it still painted green, so perhaps the owners opted to keep it that color to attract fans of the show (or maybe the producers needed to keep it green so they could return and shoot there again). Lindy's Diner occupies the key corner position in what is known as the Bliss Building. Way back in 1929, it was called the Coney Island Cafe. It became Lindy's Diner in the 1960's, and is still going strong. 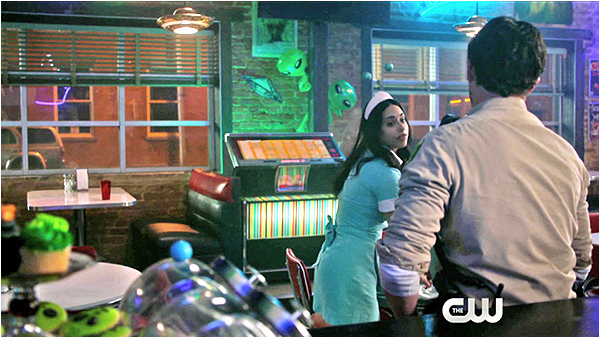 As for the interior shots of the Crashdown Café, I'm not sure whether these were shot inside Lindy's diner, or at some other location. It's typical for a new show to shoot the pilot episode on location, and then for the studio to build an identical set on a sound stage to use for the rest of the show's run. On the one hand, I see some shots in the pilot that look like they were shot from inside Lindy's diner, showing what looks like their ornate ceiling, and identical views out the windows (that perfectly match what I see in the Google StreetViews). 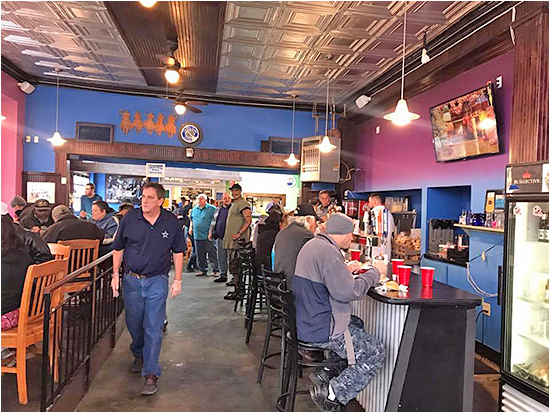 But if they did shoot inside Lindy's, the set decorators really did a job on the interior, because it doesn't look much like the usual inside of Lindy's. 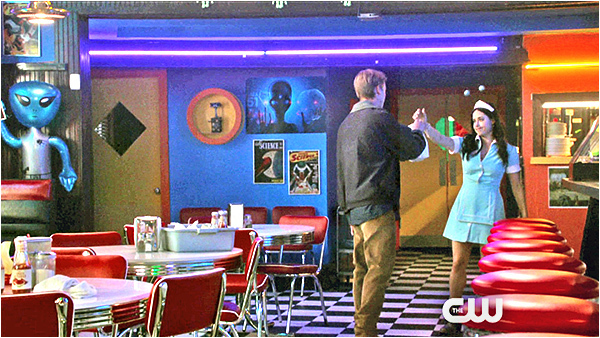 It's been redone in a '50s diner effect, complete with red stools at the counter, a checkerboard floor, neon tubes, different tables and chairs, and a jukebox. So, given the matching views, my hunch is that they did indeed film those interior pilot-episode scenes inside the diner, but I can't guarantee it. Now, what about the Sheriff's Office? 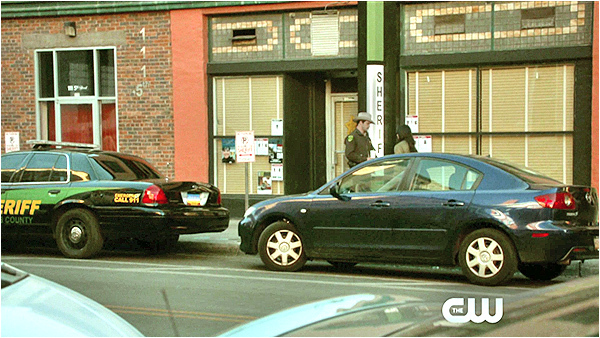 That was filmed right around the corner from the cafe, on 5th Street, in an empty storefront along the east-facing side of the same Bliss Building. The simple storefront is between 109 & 111 5th Street. They added a vertical "Sheriff" sign just to the right of the doorway, added a fake "sheriff's parking" sign, and put up venetian blinds on the windows to block the view inside - and that was about it. Instant Sheriff's Station. 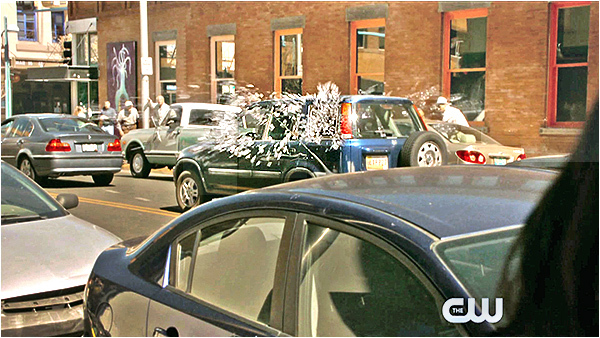 A later scene in the pilot episode, of a car's windows suddenly exploding (thanks to the powers of Michael), was also shot right here, in the middle of 5th Street, with the camera looking northeast. 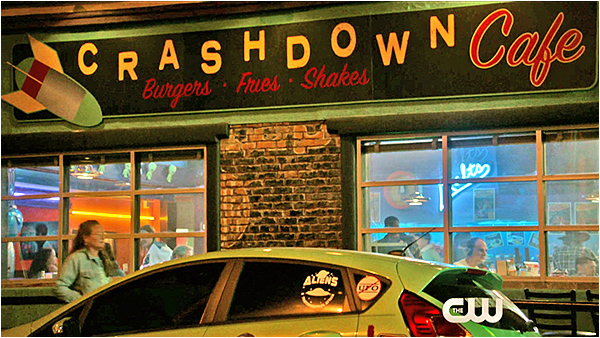 Just when I thought I had firmly established the location of the Crashdown Café, they went and moved it on me! I had heard that after the pilot episode was shot, the show had moved production from Albuquerque, New Mexico to Las Vegas, New Mexico. So, that's where I started looking for the new Crashdown Café. Fortunately, that first establishing shot of the new building made it easy for me, because you could also see the name of a business right across the street from the café: "Korte's". So all I had to do was Google for that name and its address, then use StreetView to look at that general area. And sure enough, the building used as the new Crashdown Café was right across the street. In real life, it turned out to be "Plaza Drugs", a vintage drugstore, which can be found at 178 Bridge Street, in Las Vegas, New Mexico (not Las Vegas, Nevada). In that establishing shot above,we are looking at the west-facing side of the building. It is located on the east side of a traffic circle, which surrounds Plaza Park, the center of Las Vegas's Old Town district. The drugstore is located on the east/northeast side of that traffic circle, at a three-way intersection of Bridge Street, S. Gonzalez Street, and Plaza Street. A little research shows that this plaza dates all the way back to before the Mexican-American war, when the town was part of Mexico, before American troops arrived in 1846 arrived to seize it from Mexico. 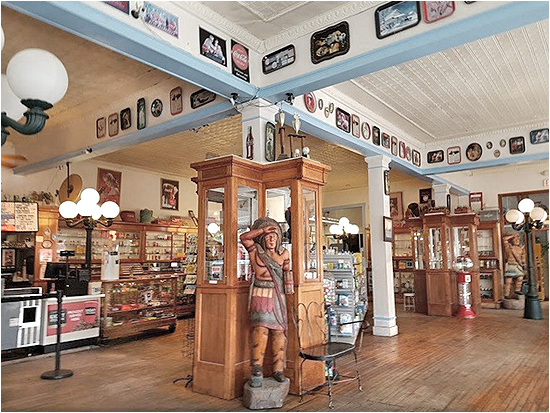 But, since this location is a drugstore and not a restaurant, in real life, it would at first appear that there would be no possibility that they actually could shoot any interior scenes in the store. Instead, no doubt they will use the building only for exterior shots, and then shoot the interiors on a set at the studio. 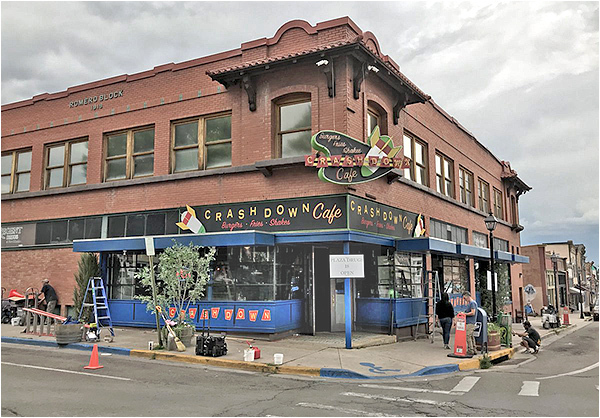 But doesn't look much like the Crashdown interior (it has wood floors, and even a wooden "cigar-store Indian"), so I still doubt that they'll use it for interiors - but it's worth mentioning.